… than messin’ ‘bout in Classic Yachts? 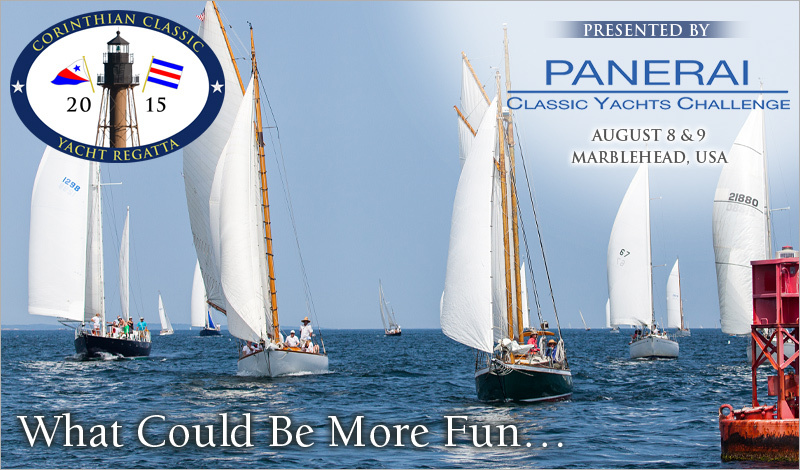 The Corinthian Classic Yacht Regatta presented by Officine Panerai (www.panerai.com), August 8 & 9. This regatta is a blast! Easy to sail. Long reaching legs.NO Spinnakers. The “Panerai fleet” is open to sailing vessels with a minimum waterline of 20’, designed in or before 1967 and built using original methods and materials; wood, steel, or aluminum. The “Spirit of Tradition fleet” is for those yachts designed with the intent to evoke traditional clean classic lines above the water line and modern underbodies below, and built after 1967. The season is short. Plan on having some real fun this summer by registering to be a part of the Corinthian Classic August 8 & 9. Start planning now. Instructions to enter can be found on our website at www.corinthianclassic.org or call Timmy Dittrich 781-248-3836 or Bruce Dyson 617-285-1182 for more information.